The cavernous Berlinale Palast theatre was packed to the gills for today’s noontime press screening of “Coriolanus” (***), and small wonder — in a Competition lineup heavy on oatmeal fare boasting comparatively unfamiliar names, Ralph Fiennes’s directorial debut is one of the few entries that affords viewers a little star-gazing. Fiennes, of course, takes the title role in his revisionist take on Shakespeare’s under-filmed tragedy, with Gerard Butler, Brian Cox and the soon-to-be-ubiquitous Jessica Chastain adding further name appeal. As the crowd staggered out of the auditorium two hours later, the name being murmured most approvingly was that of the film’s oldest and most distinguished star. And with good reason. As Volumnia, the proud, politically-minded mother of the titular Roman general, Vanessa Redgrave gives one of “those” performances, an Olympian masterclass in classical acting that conjures spontaneous emotional fire upon a bed of immaculate technique. Just listening to the richly controlled tremors and modulations in her voice as she powers her way through a titanic final monologue — turning her son’s political persuasions through reams of exquisite language — is enough to raise hairs on the back of your hands; all too rare are the opportunities to watch our greatest actors wrestle such material on screen. Indeed, in recent years, Redgrave has reserved her most committed thespian efforts for the stage: as valued a supporting presence as she has been in film projects ranging from “Atonement” to “Letters to Juliet,” it’s safe to say she hasn’t had a big-screen showcase this generous since “Howards End” nearly 20 years ago, and still, her work here outstrips that for difficulty and magnitude. 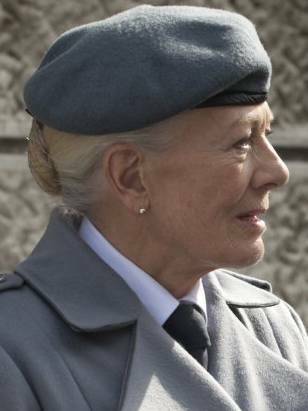 Berlin isn’t usually the festival for such pronouncements (nor are such predictions ever wise, least of all in the dark days of February) but I’m going to make one anyway: Vanessa Redgrave will receive a 2011 Oscar nomination for Best Supporting Actress. If the performance itself weren’t enough to set a campaign in motion, the fact that “Coriolanus” has just been acquired by The Weinstein Company certainly is. If everything in Fiennes’s film was quite as staggering as Redgrave, we’d be looking at a Shakespeare adaptation for the ages. In case that star rating at the top of this piece didn’t tip you off, it’s not. Vastly shorn of text, but tidily updated by screenwriter John Logan to a modern-day military setting that fuses Roman geography with British cultural reference points — in a delightful touch, BBC newsreader Jon Snow turns up as an iambic pentameter-spouting version of himself — “Coriolanus” runs hot, cold and very, very loud for much of its running time, until both Fiennes’s conceptual ideas and the actors’ energies peak in time for a knockout final act. Fiennes’s aggressive militarization of the material extends to hiring the great DP Barry Ackroyd, fresh from lensing combat films for Kathryn Bigelow and Paul Greengrass, to lend the film a vérité texture that, ironically enough, comes over a little dated; on another note, it’s hard to gauge how aware Fiennes’s is of tonal resemblances between his treatment and Richard Loncraine’s Third Reich-flavored “Richard III.” If the film is perhaps less radical than its makers imagine, however, its considerable achievement is that the update works, making contemporary political sense even within its ambiguous milieu. Surprisingly, Fiennes’s performance turns out to be a less reliable asset than his direction. With his capacity for calculating impenetrability, the actor was born to play this most unreachable of Shakespearean anti-heroes, but for every icily authoritative note he strikes, there’s one of thin, ill-judged shoutiness that overeggs the fury in the Bard’s words. Still, if Fiennes the director hasn’t yet found a way to manage and discipline Fiennes the actor, he draws impressive work from the likes of Butler and Cox — while Redgrave’s majestic, film-elevating turn says much for his ability to capture lightning in a bottle. Academy voters, I know you’re busy with other matters right now, but take note. And Redgrave has never won a best actress Oscar….would be interesting if she was in the mix with Meryl Streep and Glenn Close next year. Yeah, it’s definitely a supporting role. I’m quite interested to see this. “Coriolanus” is one my favourite B-level Shakespeare works. I saw a production at Stratford a few years ago with Colm Feore in the title role that was quite good. There doesn’t seem to be much of a winner’s narrative for her. She has a total of 2 Bafta noms and already has an Oscar and Globe. She also has 2 Emmys, a Globe, and a Sag on TV since her Oscar win; it’s not like she’s starving for awards. I was already excited, but if she’s better here than in Howards End? Forget about it. I’m going to check out Orbitz for flights to Berlin. Well, technically, he didn’t say better. He said that the accomplishment is more impressive because of the nature of the role. why does there always have to be a narrative? People should stop voting with their hearts and start using their brains a bit. If her performance alone merits a win (ala Mo’Nique), then it should win. just don’t pull another Cannes and please look after yourself this time, Guy! even though our tastes aren’t always the same, there’s NO online critic’s opinion I take into consideration more than yours (sorry Kris =P). cheers, and have fun, and don’t let my morbid jealousy (especially of you being in cold weather while I’m roasting here in Rio) make anything bad happen to you. BTW, did any Brazilian films make the fest???? So is this our first contender of the year? With Weinstein backing it up, I can really see Redgrave getting a nod. And the reviews have all been positive, so I’m definitely going to watch out for it. Yes its time for vanessa redgrave to be noticed again by the academy. She is simply brilliant and Katharine Hepburn’s favourite younger actress. I love The Bostonians. i think Naomi Watts for the Edgar Hoover has a great shot of being nominated next year.A Clint Eastwood movie does wonders for its actors.plus being a bit overdue with the goodwill from last year for fair game makes her a strong contender. Todd/Robert/FC: I clearly state Best Supporting Actress in the article. Oh, I know. I was specifically responding to Todd. Granted, it’s all about the performances, BUT the prospects of having Streep, Close and Redgrave as frontrunners for next years female acting honors, is somewhat boring to me. Why, is it the 1980s all over again…? I would much rather see young, upcoming female blood in contention (Michelle Williams for the win anytime soon! ), rather than old dinosaurs roaring in unison. BUT, hey, if the performances are worthy, it is all fine by me. It’s just, as a prospect for 2012, it’s a tad bit…regressive? That should really upset the folks at awardsdaily…..ha ha! Vanessa Redgrave is one of my favorite actresses of all-time. And funny enough, I just re-watched Howards End 2 days ago. Looking forward to Coriolanus greatly. Sounds great. I’m really excited for this film and the part on Redgrave just makes it even more exciting. And I’m already pissed that this film’s going to be dubbed, when it returns to Germany in late 2011 or early 2012. I want to know why I never manage to go to the Berlinale. Now I’m really looking forward to what you think of “The Future”, Guy! Good for Redgrave. I’d love to see her nominated. She’s a undisputed legend, and she’s had a tough couple of years personally, with the deaths of her daughter and sister. Not that professional accolades can make up for that, but it would be nice to see her noticed for her work again. My early bets for BSActress are Emily Watson in War Horse and Patty Clarkson in One Day. Awesome! Excited for this one. Now if only they could fix that dreadful poster. Meryl is winning next year so if Redgrave knows what is good for her, she should campaign for supporting. Julian for those of us you care more about actresses than actors – the older the better. Old men have the luxury of winning sentimental Oscars at latter stages of their career. The last time an old lady won an Oscar for Best Actress was Helen Mirren and the only reason she did was she was the front runner and her closest competition was another old lady whose a previous winner. It would be cool if next year nominations for Best Actress would be dominated by older actresses. I really hope this year will be another great year for actresses. Guy, I saw Coriolanus yesterday in Berlin as well and I couldn’t disagree more with your review. The film is tedious as anything I have seen in a long, long time… and I work in the business so I get to see a lot every year. The performances go from pitch-perfect to absolutely over the top in one sentence, specially Fiennes. They seem to be shouting at you as if they were on a stage, even if they are on close up. It is true that Redgrave is best in show, but sometimes she also goes too far. I wouldn’t be surprised if she would end up nominated for the oscars next year (it’s a supporting role, no doubt about that), but in my book, her performance is uneven and sometimes out of control. As far as the film itself and Fiennes (as a director), he makes most of the time all the wrong choices. The modern-day setting could have worked wonders, as what the play is about is very much present these days, but Fiennes does not put the focus on that but on the lines, placing most of the action in closed spaces and with very few characters. It all feels too staged at the end, it does not ring true and some sequences (i’m thinking the one on the tv show) are just painful to watch, almost ridiculous. On another note, look out next year for Michelle Williams in Sarah Polley’s upcoming film Take This Waltz. I saw a long promo in Berlin and she seems to be absolutely amazing. Sorry guys, missed the supporting reference. I heard people walked out of this and I’ve read some very bad reviews as well.. I couldn’t agree more. Imagine is Dench, Streep, Close, Redgrave, Michelle P. etc. etc. dominated the acting categories. All will be right in the world again.